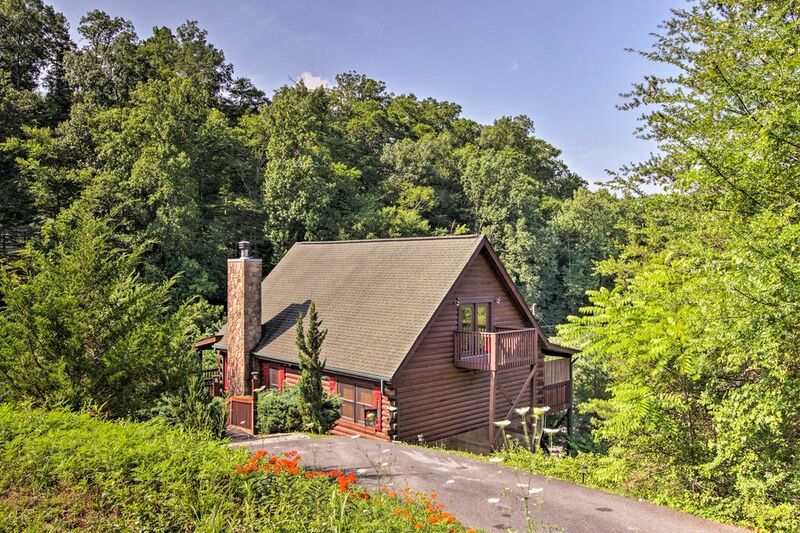 Have an idyllic Smoky Mountain escape when you stay at this cozy Sevierville vacation rental cabin. 'Huckleberry Holler' has 2 bedrooms and 2 bathrooms and awaits 4 guests in its spacious lodge-style interior. Play in the game room inside or unwind next to the resort's community pool before visiting the nearby Great Smoky Mountains National Park. Dollywood and Pigeon Forge are never far from this charming vacation cabin that perfectly pairs the comforts of home with resort amenities. The cabin's cathedral ceilings and an open floor plan create a roomy interior space designed with relaxation in mind. With a hot tub, spacious deck and fantastic location, 'Huckleberry Holler' has it all. As part of Eagle Springs Resort, you will have full access to the community pool and picnic pavilion. Take it easy on the leather couches around the wood-burning fireplace and watch your favorite show on the flat-screen satellite TV. Wireless internet access makes it easy to stay up-to-date and in touch while you're way. You'll find everything you need to test out a new recipe or cook an old favorite in the fully equipped kitchen. Eat seated on the barstools at the kitchen peninsula or around the rustic barnwood dining table. After a day of fishing on Douglas Lake, prepare your catch on the gas grill and dine at the picnic table on the flagstone patio. Settle into one of the rocking chairs on the wraparound porch as you watch the sun dip below the treeline. Before heading to bed, visit the game room upstairs in the loft where a pool table, a Wii game system, and board games allow a little friendly competition. Step out onto the connected balcony to cool off from the games and watch as the stars come out. Retreat to the master bedroom and take a soak in the en-suite bathroom tub while you get ready to curl into bed. Catch one last episode on the flat-screen TV as you doze off at the end of another unforgettable day in Sevierville. Sevierville boasts an array of attractions that will not disappoint. Whether you're in town for a show at the nearby Sevierville Convention Center, or for the Big Bass Fishing Tournament on Douglas Lake, you'll be just minutes away at your home-away-from-home. Pigeon Forge is 13 miles away and home to shopping and dining attractions as well as the Dollywood amusement park. Eat an unforgettable meal during a dinner show at Dolly Parton's Dixie Stampede or Hatfield & McCoy. Finish off a day of exploring with a visit to one of the many award-winning distilleries in the area. Be sure to stop at Bass Pro Shop to get the gear you need before heading into Great Smoky Mountain National Park. Refuel in downtown Gatlinburg at Delauder's Smoky Mountain BBQ for some traditional Southern fare. With skiing and snowboarding in the winter and mini golf and water rafting in the summer, Ober Gatlinburg Amusement Park and Ski Area offers exciting activities no matter the season. Ride the scenic chairlift or aerial tramway to get some of the most spectacular Smoky Mountain views available. Clean! Secluded! Everything one needs to have a wonderful stay including coffee, popcorn, hot chocolate and the list goes on. Fully equipped. Now our go-to spot. I’ll never go elsewhere. Well kept. Owners responsive. Jacuzzi was perfect. Game room pool table and ping pong a little old but functional. Clean and comfortable. Great location, close to everything. Cabin had all amenities needed. Owner easy to contact and full of information about the area. My 12-year-old son and I stayed in this cabin for 3 nights during his school's fall break. It looked great in the post, but was even better than expected. The location is excellent -- out of the traffic but close to everything you want to do. The owner was great to deal with and added lots of extra little touches to make sure everything was perfect. The pool, hot tub, ping pong and pool table offered lots of great entertainment. The entire cabin was spotless and the owner provided everything we needed for our stay. We really enjoyed our stay, which went by way too fast, but hope to visit again soon. My family had a great time. Everything was perfect. We would stay again.